In ThoughtFarmer 6.5 we enhanced social features including liking, favoriting and commenting to provide the richest social experience yet. We also redesigned people profiles to create a more visually appealing and easier to navigate personalized space for employees. The result is an intranet that increases adoption, engages employees, and keeps everyone coming back for more. Everyone loves to get positive feedback from their peers. We’ve extended Liking to comments and newsfeed items so employees can easily recognize their peers for news articles, comments, and pages. These feel-good moments encourage authors to frequently share good quality content on the intranet. See who liked your comment by clicking on the link. Keep everyone in the loop. The favorite button lets users follow pages to receive email notifications about changes. We’ve now added the ability to see who has favorited a page, so you’ll know who is receiving notifications about your project. The “favorite” feature lets you see who is following a page and lets you save a page in your app bar for later. Get where you need, faster. We’ve made tweaks to the search results page to make it easier to filter and navigate. Usability enhancements include better pagination, more visible filters and search terms, and a bigger search box. We also enhanced the employee search directory, to make employees skills and expertise easier to find. Be yourself. The new profile page layout has a bigger, croppable profile pic, and a more visually appealing and easier to navigate layout. This makes employees’ own personal page feel more personal. 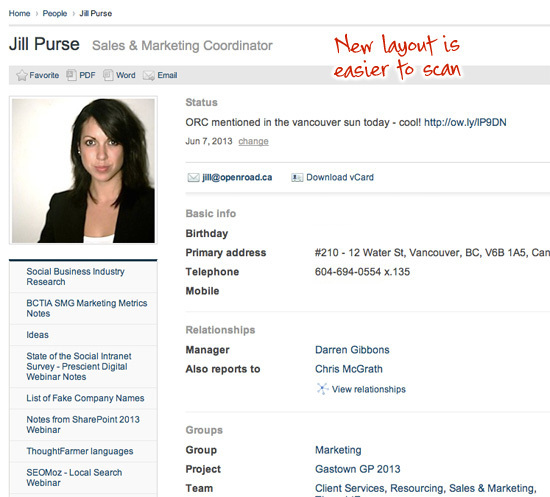 Redesigned profiles focus on the employees profile picture and are easier to scan. In our 6.0 release, we made a number of enhancements to document libraries. The result? A lot of files being uploaded to the intranet! 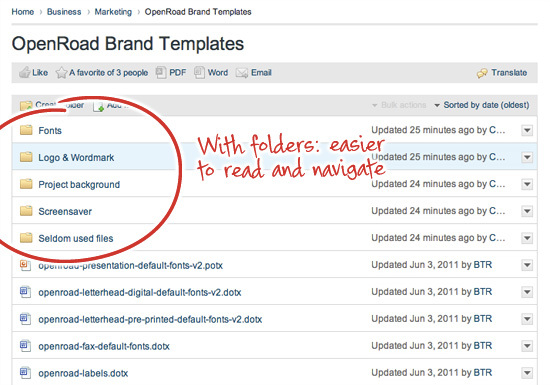 We’ve now added folders, so you can keep your documents nice and organized. Additional organization features include download as a zip folder, collapse and expand nested folders, and bulk move, to make organizing files intuitive and enjoyable. New folders make if faster to find and organize files. Typo? Uh-oh. For those of us that type too quickly, we’ve added a 2-minute edit window to comments. Users often notice their typos immediately after hitting the “Post reply” button. Site Sync: ThoughtFarmer Site Sync synchronizes employee information between two or more ThoughtFarmer intranets. For example, in a group of sister companies, each company can have its own private ThoughtFarmer, while the mother company has an overarching ThoughtFarmer. Site Sync keeps user information in sync, so everyone can access the overarching ThoughtFarmer and its single, consolidated employee directory. Location-based Security: Administrators can now restrict access to ThoughtFarmer based on a user’s physical location. For example, a user at head office may be able to access all pages, while a user who is traveling may be restricted from accessing a section with trade secrets. Location-based security is based on a user’s IP address. Images in RSS feeds: ThoughtFarmer now displays thumbnail images referenced or embedded in external RSS feeds and includes the option to embed images within the RSS feeds it generates (using base64 encoding). You’ll “Like” the new Like Button.